The 2014 ProForm 505 CST Treadmill offers an impressive array of fitness features for only $589.99. The Quick Incline and Quick Speed Controls allow you to quickly and easily change the incline and speed at the touch of a button, while the handlebars contain sensors for the Dual-Grip EKG Heart Rate Monitor. The wide viewing angle of the six-inch (15.24cm), backlit display enables anyone to see the information on the screen, regardless of height. A certified personal trainer created the 15 built-in, automated workouts with audio contributions from Jillian Michaels. This treadmill includes an Interplay Music Port and Intermix Acoustics 2.0 Sound System. The ProForma 505 supports exercisers weighing up to 300 pounds (136kg). The treadmill weighs 186 pounds (84kg) and, unfolded, it measures 70″ long x 34″ wide x 59” high (177.8cm x 86.36cm x 149.86cm), but, for storage, it folds to a 34″ wide x 39″ deep footprint (86.36cm x 99cm). The treadbelt measures 55″ long x 20″ wide” (139.7cm x 50.8cm). ProForm offers a 25-year warranty on the motor and a lifetime warranty on the frame. Adjust manual incline and speed at the touch of a button. Range of speeds allows either walking or running workouts. Simple navigation makes choosing an automated workout program easy. Choose from 15 built-in, automated workouts based on calories burned or time or distance goals. Inclines of built-in workouts powered by Google Maps. Track your heart rate with handgrip sensors; no wristband, armband, or finger monitor to wear. 2.25 CHP Mach Z motor and treadbelt built for quiet operation. Axial fan extends motor life by cooling motor and internal components. ProShox Lite 3 Cushioning protects joints. The Porform 505 is versatile home treadmill for both walkers and runners. The 15 built-in, automated programs use Google Maps for changes in incline that duplicate a walk or run in the chosen locations. Simple navigation controls allow you to find the automated program you want with ease. Whether your goal is to burn calories for weight loss or to walk or run for a certain length of time or at a certain speed, the Proform 505 provides programs designed to meet these goals. If you are more familiar with treadmills and walking and running programs, you can use the ProForm 505 in manual mode to create and control your own program. An automated hill-climbing program is built in, but, in manual mode, you can choose inclines from 0% to 10%. You can easily change the incline during the course of your workout with one push of the Quick Incline Control. Similarly, you can increase or decrease the speed at various stages of your workout with a push of the Quick Speed Control. The Quick Speed Control changes the speed in one mile per hour increments, while the incremental button changes the speed in one-tenth of a mile increments. 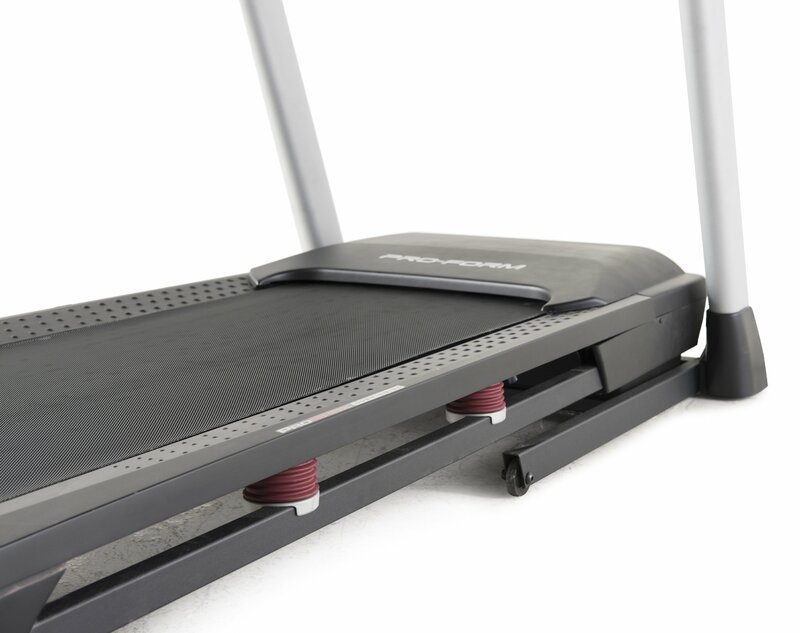 Speed settings range from zero to 10 miles per hour, which makes this treadmill useful for walkers, joggers, and runners. If you enjoy walking or running to the beat of your playlist, you can plug your iPod or MP3 player into the Interplay music port. There is convenient resting place for your iPod or MP3 on the console shelf. The Intermix Acoustics 2.0 Sound System built into the ProForm 505 provides rich, equalized sound across a broad range of frequencies. Both the treadbelt and the motor are designed to run more quietly than the average treadmill, allowing you to enjoy your music or your television while you exercise. The belt also protects your joints with ProShox Lite 3 Cushioning, while the axial fan cools the motor and the drive system, reducing noise and prolonging the motor’s life. While opinions differed on the noise level of the ProForm 505, the most common complaints regarded the weight and the time required for assembly. Everything but the belt and stand base must be put together. Assembly requires tipping the heavy base on its side more than once, so, while some reviewers reported that they or a husband or boyfriend had successfully assembled the treadmill working alone, having someone to help with moving the base and aligning the various pieces could speed up the process. Some reviewers reported assembling the treadmill in about an hour, but more reported that assembly took two hours or more. Most of the reviewers who complained about noise attributed it to operating the treadmill at higher speeds or to use by a heavier person. Either situation would place greater demands on the motor and the drive system, so more noise might be expected under those conditions. While one reviewer compared the noise level to that of a vacuum cleaner, most commented that they only had to turn the volume up slightly to hear their music or televisions. One reviewer said that the music drowned out the noise of the treadmill. Most of the reviewers agreed, that, while the ProForm 505 is a good treadmill for home use by the average person, serious athletes who regularly train to run marathons would look for, and be better off with, a gym quality model, not the ProForm 505. Still, those who had done extensive research before making their purchase stated that the ProForm 505 was superior to other treadmills in the same price range both in quality and features. Most did agree that assembling their treadmills had been a time-consuming process, but they also reported that when they began using the treadmill they found it to have been worth the effort. Those who had been using their ProForm 505 regularly for some months were happy with their choice and reported success in achieving their fitness goals.